German Sanskritist and comparative philologist; born at Nörten, Hanover, Jan. 28, 1809; became a convert to Christianity in 1848; died June 26, 1881. His father, who had seven children besides Theodor, was a Jewish merchant deeply versed in the Talmud. Theodor received his preliminary training at the gymnasium in Göttingen, which he left at the age of sixteen for the university of the same city. As a university student he devoted himself to classical philology, and remained in Göttingen—with the exception of the year 1827, spent at Munich—until 1830. On Oct. 24, 1828, he received the degree of Ph.D., and the year following became privat-docent. He left Göttingen in 1830 and lived in Frankfort-on-the-Main for two years. Here he occupied himself with a translation of Terence, his only printed contribution to classics; and, what was of far more importance for his life-work, devoted himself seriously to Sanskrit. In 1832 he left Frankfort for Heidelberg, where he contemplated teaching Sanskrit, but his love for his alma mater was too strong to permit him to become a member of the faculty of another university. Accordingly, in 1834, he returned to Göttingen, where he began his teaching rather in classical than in Oriental or comparative philology. Gradually, however, he concentrated his energy on Sanskrit and comparative linguistics. Benfey's teaching covered a large range within his chosen limits. In addition to his regular work he lectured on Indian antiquities, on the Avesta, and, going farther afield, gave courses in ethnography from the linguistic point of view (1843), and in Bengali and Hindustani (1863-64). It is interesting to note that, in 1843, he lectured on the affinity of the Egyptian and Semitic groups of languages. This single series of lectures, together with the book which was the result of the course—"Ueber das Verhältniss der Aegyptischen Sprache zum Semitischen Sprachstamm," 1844—is his only important work that deals with Semitic linguistics. His literary activity began comparatively late. Before 1839 he published very little. Even his doctorate dissertation, "De Liguris," and his dissertation to obtain the venia legendi, "Observationes ad Anacreontis Fragmenta Genuina," remained unprinted. Besides the translation of Terence in 1837, already referred to, and a few reviews, his only work published prior to 1836 was one written in collaboration with Moritz A. Stern, "Ueber die Monatsnamen Einiger Alten Völker," 1836. The silent years before 1839 had been a time of preparation, but after that period his contributions to linguistics were numerous. His "Griechisches Wurzellexikon," 1839-42, won the Volney prize. 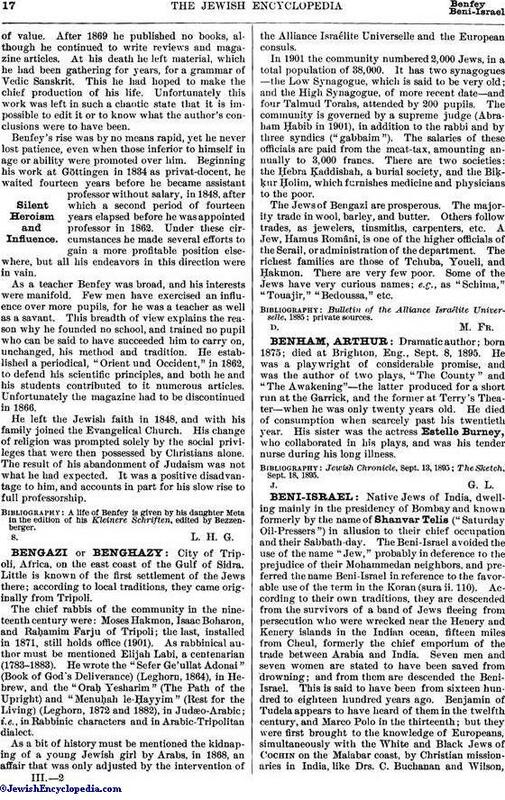 The year 1840 saw the appearance of his article on "India" in Ersch and Gruber's "Encyklopädie der Wissenschaften und Künste," and his Semitic contribution, already noted, was published in 1844. In 1847 he brought out the first German edition of the Old Persian Inscriptions, basing his work mainly on Rawlinson's results, which had appeared the previous year. The year 1848 was the date of Benfey's edition of the Sāma Veda, with introduction, glossary, and translation. He published in 1852 his "Vollständige Grammatik der Sanskritsprache," and followed this the next year with his valuable "Chrestomathieaus Sanskritwerken," and in 1855 with his "Kurze Sanskrit-grammatik." 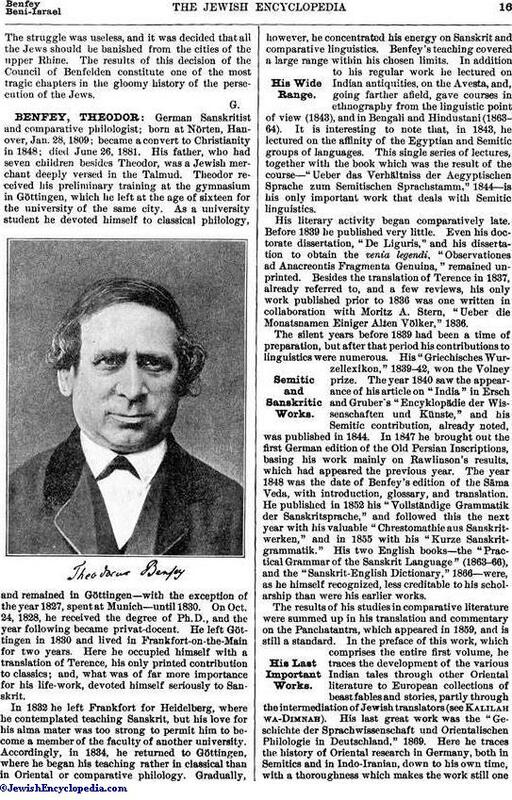 His two English books—the "Practical Grammar of the Sanskrit Language" (1863-66), and the "Sanskrit-English Dictionary," 1866—were, as he himself recognized, less creditable to his scholarship than were his earlier works. The results of his studies in comparative literature were summed up in his translation and commentary on the Panchatantra, which appeared in 1859, and is still a standard. In the preface of this work, which comprises the entire first volume, he traces the development of the various Indian tales through other Oriental literature to European collections of beast fables and stories, partly through the intermediation of Jewish translators (see Kalilah wa-Dimnah). His last great work was the "Geschichte der Sprachwissenschaft und Orientalischen Philologie in Deutschland," 1869. Here he traces the history of Oriental research in Germany, both in Semitics and in Indo-Iranian, down to his own time, with a thoroughness which makes the work still oneof value. After 1869 he published no books, although he continued to write reviews and magazine articles. At his death he left material, which he had been gathering for years, for a grammar of Vedic Sanskrit. This he had hoped to make the chief production of his life. Unfortunately this work was left in such a chaotic state that it is impossible to edit it or to know what the author's conclusions were to have been. Benfey's rise was by no means rapid, yet he never lost patience, even when those inferior to himself in age or ability were promoted over him. Beginning his work at Göttingen in 1834 as privat-docent, he waited fourteen years before he became assistant professor without salary, in 1848, after which a second period of fourteen years elapsed before he was appointed professor in 1862. Under these circumstances he made several efforts to gain a more profitable position elsewhere, but all his endeavors in this direction were in vain. As a teacher Benfey was broad, and his interests were manifold. Few men have exercised an influence over more pupils, for he was a teacher as well as a savant. This breadth of view explains the reason why he founded no school, and trained no pupil who can be said to have succeeded him to carry on, unchanged, his method and tradition. He established a periodical, "Orient und Occident," in 1862, to defend his scientific principles, and both he and his students contributed to it numerous articles. Unfortunately the magazine had to be discontinued in 1866. 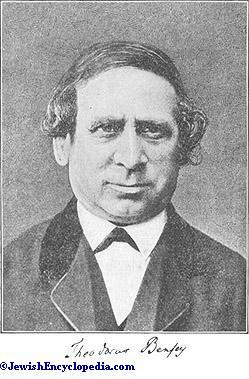 He left the Jewish faith in 1848, and with his family joined the Evangelical Church. His change of religion was prompted solely by the social privileges that were then possessed by Christians alone. The result of his abandonment of Judaism was not what he had expected. It was a positive disadvantage to him, and accounts in part for his slow rise to full professorship. A life of Benfey is given by his daughter Meta in the edition of his Kleinere Schriften, edited by Bezzenberger.